I love oracle cards. Especially decent cards with great imagery and wisdom. I grew bored with another creator who has swamped the oracle card market (no names mentioned because I’m sure you know who they are) and the lack of depth in those cards. Sometimes we need to drop the illusions and realise it’s not all about ‘the light’, and that ‘the dark’ has just as much juice and wisdom held within it. Needless to say, these cards are not dark, but I had a friend skip over them, who was put off by the intenseness of the visuals, which to me are captivatingly beautiful. If you want all your cards to have the same message where each card relates to every single person because the wisdom is so general, these are not your cards clearly, but if you are looking for something with more depth, and more interest and value, these are most certainly your cards. To me, oracle cards must be empowering and teach me to go within. They shouldn’t be just positive platitudes that are as much use as a scoop of ice-cream dropped on a hot sandy beach. Give me light and dark, love and healing, alluring and mysterious because after all isn’t this what being human is all about? So onto these deliciously magical cards. I have to say before I start this review that I am an Alana Fairchild fan, so admittedly I may be a tad biased, but I had to share them with you. I am adding the whole of her collection to my birthday wish list this year. At home, I already had Alana’s ‘Wild Kwan Yin’ and ‘Wild Rebel’ Cards and happened to pop by her site and see some alluring new cards and some that really inspired my desire to connect deeper to the divine mother and the divine feminine. And if Alana is reading, I have to say that your guidebooks are books in their own right. 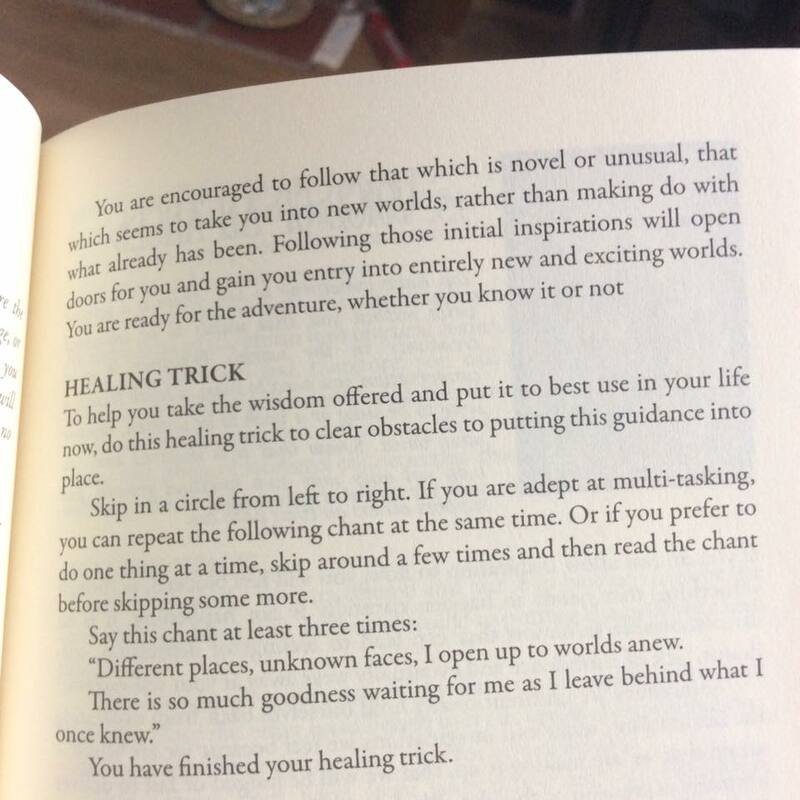 Please consider putting the wisdom of the books into non-fiction inspirational books, they deserve another audience too (because not everyone is into oracle cards and I want to see your message reach more people). For review, I was sent 2 sets of different yet very complimentary cards. ‘The Divine Circus Oracle’ and ‘Mother Mary Oracle’. I was literally in oracle card heaven. I had to start with this card deck first, because the artwork and card names made me smile so much. My inner child was incredibly pleased that I have this deck. These cards are a great size to hold and the imagery is so evocative that I fail to see how anyone can be put off by them (unless the mystical is scary?). And 44 cards is just the perfect size deck for me. 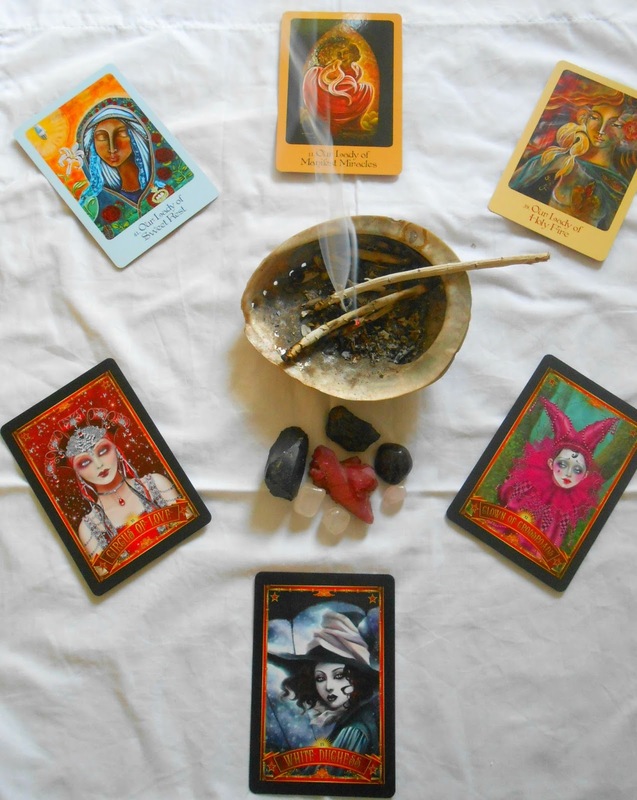 I started by smudging my cards with white sage (preparing them for first use) passing each card through the smoke and dedicating the cards for their use. Playing with these cards for a few days now and picking a card each day has really set me up for the day. Amusingly I have received 1 card 4 times now so I have to listen up. The depth of Alana’s guidebooks that come with her cards always astound me. And while The Divine Circus card message is not as long as some of her other decks, they are just as profound. Look at the imagery! These cards strike my inner fire. The artwork combined with the wisdom of Alana are a perfect match. 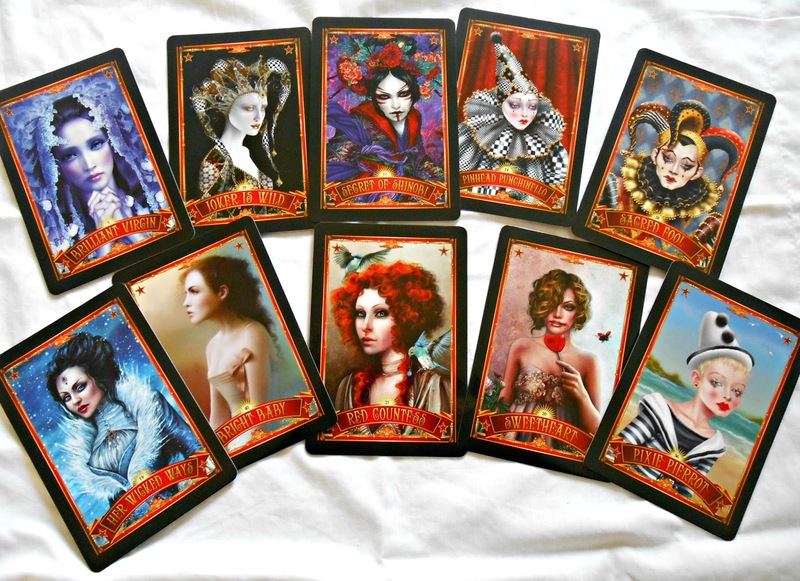 The Divine Circus is a deck to awaken the rebel within you; the ‘you’ that has been hidden behind the masks of society’s conventions and what you are told you ‘should’ be in this life. It is an oracle to help you discover the creative, quirky, eccentric or wild free child within who is aching for release. These cards are an absolute breath of fresh air in an age where repression and control is everywhere. A selection of cards that enable me to break out of the box of my own self-made limitations. What I also love about these cards are tricks which are part of each message. One day I picked a card and I had to skip around in a circle while reciting a statement, it made me feel all giddy inside and whirled my energy up big time. This is a deck for the entertainer, the inner child, the emotions, mysterious, beautiful, fiery, peace-loving, divinely inspired feminine (my best friend who is male adored these cards too). They are not specifically for the female, but I imagine women will be very drawn to them. 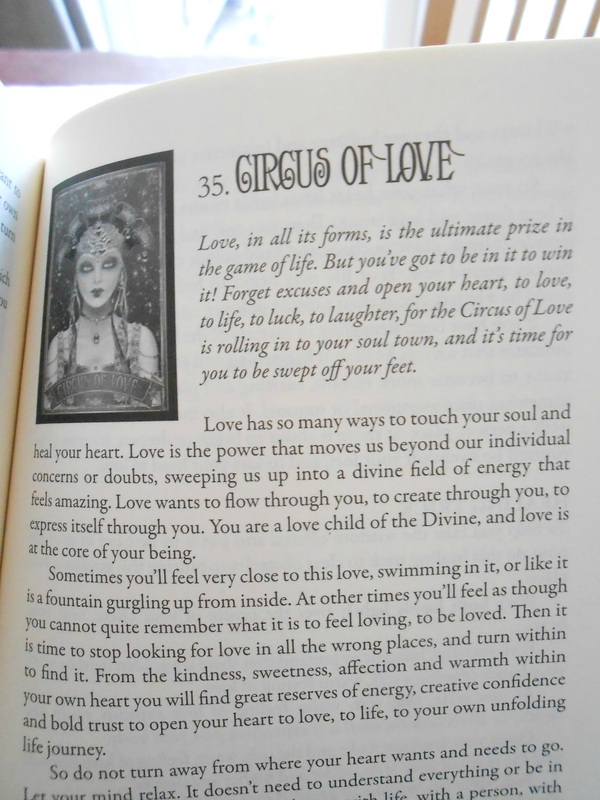 Here is a sample of Alana’s inspired message for the ‘Circus Of Love’ card I picked today. As you can see she has a beautifully poetic way of writing. Within each message is a Trick to be carried out and these can include visualising and repeating a statement which often feels empowering. And ends with an affirmation. And while I have never been a fan of affirmations, these are not the same. They feel to me like statements that are true, because your spirit picks the card so the message really relates to what is going on for you at the time. What I like most about this oracle is it really is profound and deeply meaningful. I am going through a lot of change in my life and I am feeling a sense of unravelling of the old and if I’m honest I feel scared for the transformations coming soon. I can feel the forward movement, I’m not quite yet into the change, but I am stepping towards it. One thing about change is that it can involve other people not appreciating the new you, and I have felt this in my world too. People who on the surface appear to be supportive, but their energy and behaviour reflecting otherwise. One of the cards I received was called ‘The Snow Queen’ and spoke exactly about this subject and how to handle the experience when this happens. Impactful, intense, beautiful imagery. Incredible messages and fun tasks to do also. A deck that literally hypnotises you to pick a card every day. It may not be for everyone. It is very feminine in its design and not everyone may like the Circus aspect to it. More on this oracle card set below and turn your speakers on! The music is fantastic (SMILE). As a lover of Alana’s ‘Wild Kwan Yin’ oracle, I am finding more and more each day that a connection to the Divine Mother is becoming very important to me. I want so much to find balance inside me with the feminine, and sometimes we simply don’t have positive role models from a mother or women in our lives growing up. We all yearn for a mother who is unconditional, but not all mothers are this way. The Mother Mary Oracle takes you on a journey through the different aspects of the Divine Mother, from love to peace, to protection and more. With 44 cards in total, all with unique and valid artwork, these cards are to me, a treasure for the heart. When I need soothing, comforting, inspiring I go to Mother Mary. When I want to be impacted in a different way I reach for The Divine Circus or another of Alana’s oracles. Once again, look at the artwork. Different to ‘The Divine Circus’ but equally mesmerising. I love how wistful the artwork is on this deck. It feels like the energy of Mother Mary is weaving its way through all of the cards one by one, but as one unified whole in the deck. The thorough guidebook that comes with this deck has instead of Healing Tricks, a healing process Mother Mary guides you into. Today I pulled 3 cards from The Divine Circus and 3 from the Mother Mary Oracle and what I love about the card readings is that the messages were almost identical, but in their own unique ways. I feel like I am growing to meet the vision at the moment, I am growing into something new, a new path. 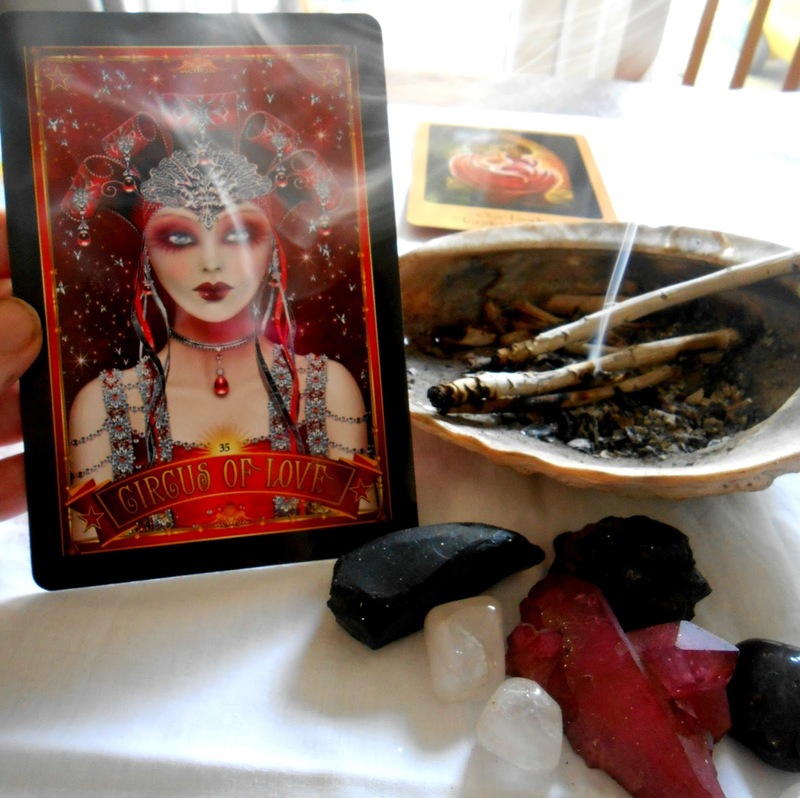 This oracle is for the woman (or man) wanting to reconnect with the reservoir of love and self-acceptance inside. A deck that ignites the heart to open and flower and take us into the best lives we can imagine and to embrace the life that is unfolding for us as we walk this human path. If you are wanting to move away from angel cards, or cards by that author I will not mention who swamps the market, this will be a great transition into a new deck of soothing, loving, spiritual cards that open the heart and help heal on many levels. Beautiful artwork and special messages within the guidebook. Probably not for someone who is an atheist or who thinks that Mother Mary comes in one form only. A spiritual deck for those who are ready for it. And I will leave you with my card layout for today before we crack on with the giveaway where you guys get to enter to win not 1, but 2 oracle card sets. 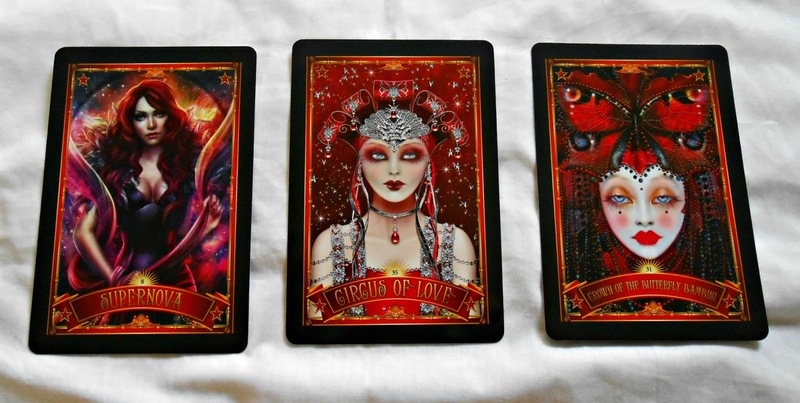 The lucky winner gets both ‘The Divine Circus’ and the ‘Mother Mary’ oracle cards. You lucky lot. 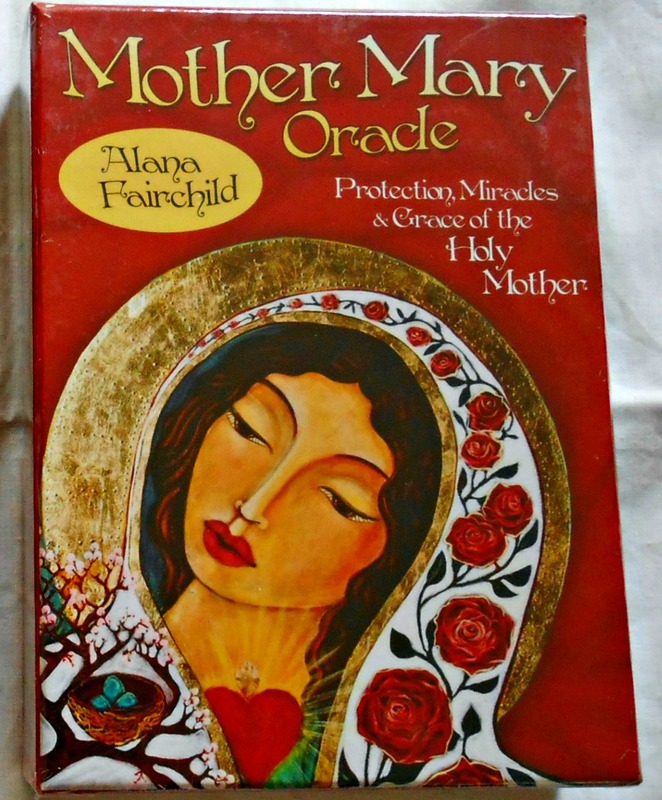 *Post Disclaimer: I received 2 x The Divine Circus and 2 x Mother Mary Oracle from alanafairchild.com for review. All opinions are my own. Next Post DESIRE – What If What You Want Is Wrong?